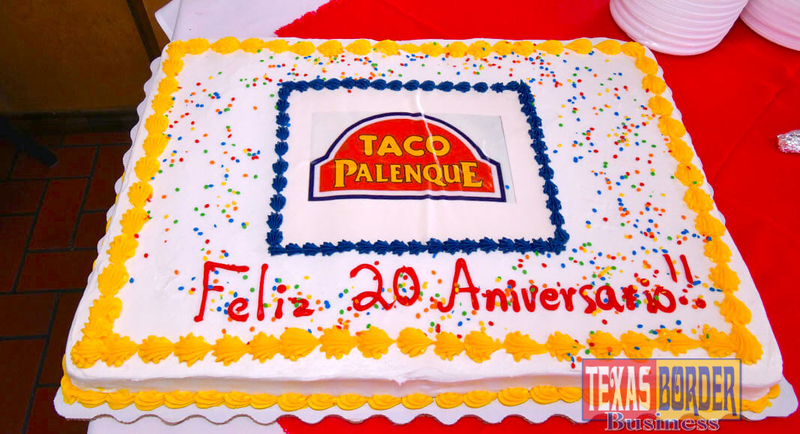 McAllen, TX – Last Thursday, October 11, 2018, marked 20 years since Taco Palenque first arrived to the Rio Grande Valley. The Mexican Food Restaurant chain with more than 20 restaurants from Laredo to Brownsville, San Antonio to Houston has a very special place in our hearts and stomachs; Taco Palenque has been a staple place to go eat breakfast, lunch or dinner or whatever you are craving, (did someone say Panchitos?). The gathering took place at the first Taco Palenque in McAllen on 1000 South 10th Street, where employees shared a great moment celebrating the 20th anniversary with cake, food and most importantly: Mariachi music! On behalf of CEO Juan Francisco Ochoa Jr., Mrs. Patricia Ochoa – the CEO’s wife – hosted the celebration and shared exciting and motivating words to those present, remembering the roots of the brand in Laredo and the growth of the company across South Texas. You can stop anytime to taste The Best Fajitas in Texas, award-winning breakfast tacos and the signature taco of the house, the Pirata Taco – enticing beef fajitas, refried beans and cheddar cheese wrapped in a warm handmade flour tortilla.